Input text: It is noon. The ground is a beach. The ground is sand. There is a swimmer. There is a giant banana split beside the swimmer. There is a grill beside the swimmer. There is a hamburger on the grill. 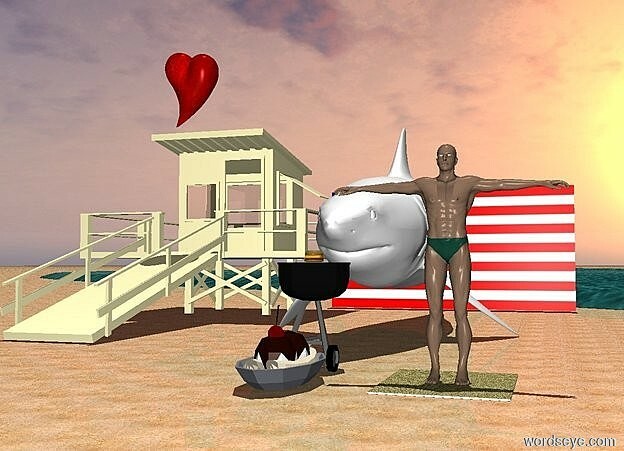 There is a giant shark behind the grill. There is a giant flag behind the shark. There is a large aqua towel under the swimmer. There is a large ivory tower left of the shark. There is a large bright cyan lake behind the flag. There is a large heart above the tower. @zamchick Yay!!! @roadstick, looks like summer is in full swing at WE. Fun day in the sun day.